Lawrence Avenue is a major east-west thoroughfare in Toronto, Ontario, Canada. It is divided into east and west portions (Lawrence Avenue East and Lawrence Avenue West) by Yonge Street, the dividing line of east-west streets in Toronto. The western terminus of Lawrence Avenue is Royal York Road. Beyond the terminus, the road continues as The Westway, a windy arterial road that ends at Martin Grove Road constructed post-World War II to serve the growing Richview neighbourhood development to the south and the Kingsview Village neighbourhood to the north. Eastwards from a short stretch in Etobicok; where it runs through the Humber Heights – Westmount neighbourhood, Lawrence crosses the Humber River and enters Weston in the former city of York. East of Weston it enters North York, and passes through the neighbourhoods of Amesbury, Maple Leaf, Glen Park, Lawrence Heights, and Lawrence Manor. Through this section the street is mostly home to low-rise residential, with some retail and office locations. East of Avenue Road the road enters the Old City of Toronto, and is a major arterial for the North Toronto neighbourhood. This is one of the wealthiest parts of Toronto. Lawrence remains almost wholly residential through this section, with many single family homes. Lawrence Avenue East is interrupted at Bayview Avenue, by the west branch of the Don River. A detour north on Bayview leads to Post Road, and a connection back to Lawrence Avenue on the east side of the valley. This detour runs through The Bridle Path, one of Toronto's most affluent neighbourhoods. East of Leslie Street, Lawrence becomes a principal arterial road, passing through Don Mills. East of the Don River is the Lawrence Avenue exit of the Don Valley Parkway and on the southside is Old Lawrence Avenue where the road used to lead to a lost bridge that once cross the Don River. Lawrence continues as a six-lane road through most of Scarborough, with many strip malls flanking its sides. Through Scarborough it is the main east-west arterial for a number of neighbourhoods, including Wexford, Bendale, Woburn, and West Hill. The segment east of Morningside Avenue is primarily residential. The road ends at Rouge Hill Drive (then becomes a driveway into a Rouge Beach Park) near the Rouge River, east of Port Union where it hits Lake Ontario. The Toronto Transit Commission's 52 Lawrence West and 54 Lawrence East (both are the longest bus route in the city), and 162 Lawrence-Donway bus routes provide service along the length of the avenue. The 54A Lawrence East surface route operates from Eglinton Station to Starspray Boulevard near Rouge Park and the 52B Lawrence West surface route operates from Lawrence Station to Westwood Mall Bus Terminal in Mississauga west of Toronto Pearson International Airport via Dixon Road. There are three rapid transit stations; Lawrence at Yonge Street and Lawrence West at Allen Road on Line 1 Yonge–University, and Lawrence East on Line 3 Scarborough, between Kennedy Road and Midland Avenue. GO Transit has two commuter rail stations on Lawrence Avenue; Rouge Hill, on the Lakeshore East line, and Weston on the Kitchener line. The Lawrence Avenue bridge over the Humber River was washed out by Hurricane Hazel; part of it remained attached to the shore, while the rest was swept away by the river. East of Victoria Park Avenue the road was also referred to as 1st Concession Road based on the original survey of the old Township of Scarborough (the line between Concession D and Concession 1). 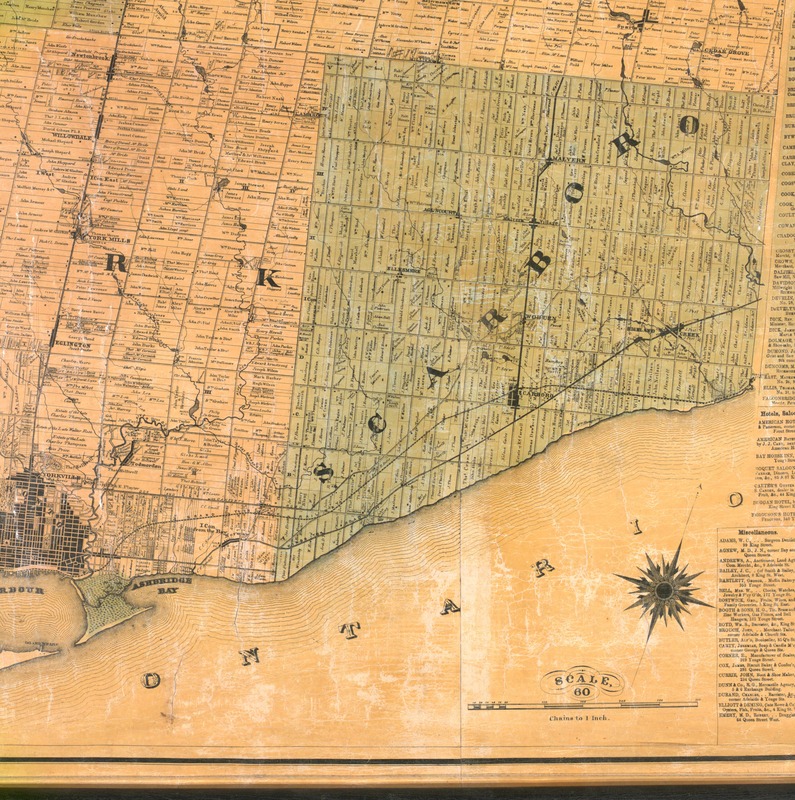 In sections west of Yonge Street the route for the current road would have been the Fourth Concession with Eglinton Avenue as Line between Third and Fourth Concession and St. Clair Avenue as the Third Concession. During Hurricane Hazel in 1954, the Lawrence Avenue bridge over the Humber River was washed out when the river's water levels rose heavily as a result of the rainfall. When the Don Valley Parkway was constructed in the 1960s, Lawrence was rebuilt between the Woodbine Avenue allowance, and Victoria Park Avenue, as a "jog eliminator" between the former concession roads of North York and Scarborough Townships. This portion to Kingston Road (former Highway 2), is a minimum of six lanes wide. Lawrence Avenue served as the "Base Line" for the Scarborough Township Survey in the 1800s, and remains a key road in that area. Lawrence Avenue east of Meadowvale Road in Scarborough was part of Colonel Danforth Trail until the early 1970s. Sanctuary Park Cemetery Royal York Road Opened 1927 and merged from Riverside Cemetery and Westside Cemeteries in 1977. Weston GO Station Weston Road Opened in 1974 as part of Georgetown Line, it has become a stop along the Union Pearson Express route to Toronto Pearson International Airport in 2015. Nearby was once CPR Weston Station. Lawrence Square Shopping Centre Allen Road Former RS Simpson Limited warehouse from the 1950s to 1970s, current mall opened in 1980s. Lawrence West subway station Allen Road The station lacks internal art work found on Line 1 Yonge–University, but found on exterior wall on the north side of south station. Opened 1978. John Polanyi Collegiate Institute Allen Road/Allen Expressway formerly Bathurst Heights Secondary School after being used by Toronto Catholic District School Board (TCDSB) for Dante Alighieri Academy Beatrice Campus and temporary home for Brebeuf College School; built in 1955 for North York Board of Education, building was vacant from 2001 to 2002. Havergal College Avenue Road Private and independent girls school moved to current site in 1926. Toronto French School Bayview Avenue Private and independent French school housed in Sifton Manor, former home of Sir Clifford Sifton from 1922 to 1947 and acquired by school in 1972. Glendon College, York University Bayview Avenue Situated in the former home of Edward Rogers Wood built in 1924 and sold 1950; home to York University since 1966. Shops at Don Mills Don Mills Road Formerly Don Mills Centre which was demolished in 2006. Lawrence East RT station Kennedy Road Opened in 1985 and will be closed in the 2020s when line re-built. David and Mary Thomson Collegiate Institute Midland Avenue named after Scarborough's first European (Scottish) born pioneer families. Built for Scarborough Board of Education (now with Toronto District School Board). Thomson Memorial Park Brimley Road Named after Scarborough's first European (Scottish) born pioneer family and opened in 1960. Cedarbrae Mall Markham Road Outdoor strip plaza opened in 1962 and later enclosed. Rouge Hill GO Station Eastern Avenue Station opened in 1967 and upgraded with current station infrastructure and was in what was once part of Pickering. ^ a b "Tremaine Map". ^ Atlas of the City of Toronto and suburbs, in three volumes, 1910. Third Edition. Volume 1, General Key.